We are already in an earnings recession. Earnings estimates are under pressure from slower growth and margin pressures. 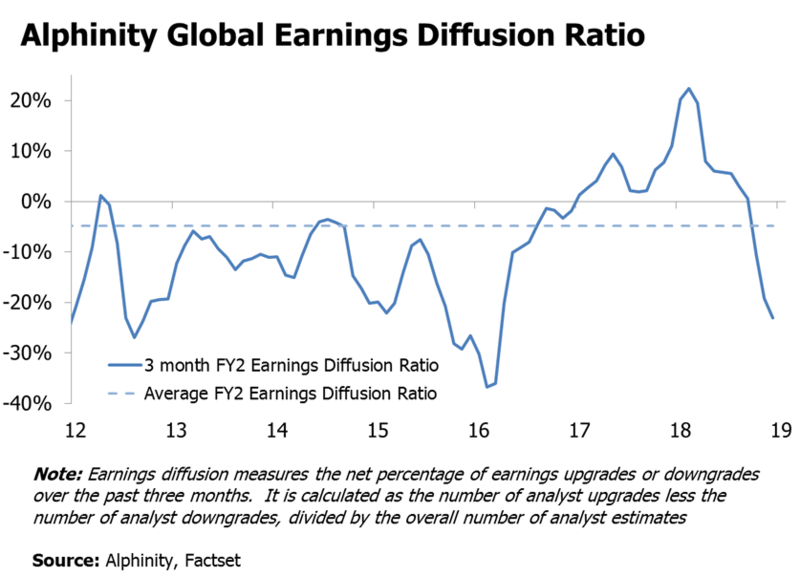 This has driven the Alphinity Global Earnings Diffusion Ratio sharply lower over the last twelve months - with a move below zero showing downgrades now outnumber upgrades. Most impacted have been cyclical sectors and regions such as Asia, while Utilities, Real Estate and the U.S. have held up relatively well. Further downside is likely over the earning season. The largest near-term challenge for markets is now the upcoming earnings season. Following the recent Apple warning, other companies similarly exposed to China may also be forced to lower guidance. Higher wages, tariffs and interest costs are also headwinds. An economic recession in 2019 is far from certain. Financial conditions and leading indicators suggest growth is likely to slow further, potentially significantly; although a more dovish Fed and further Chinese stimulus are positive developments and may yet be enough to avoid a US recession this year. Bulls argue that consequently financial markets have become too bearish. Bear markets are not always preceded by economic recession. The link between recessions and bear markets is not perfect, for example as recently as 2011 the S&P 500 fell 22% with no associated recession. Indeed, bear markets can create recessions (e.g. 2008), or simply reflect tighter financial conditions and a lower earnings outlook. A more dovish Fed is positive, but earnings revisions still need to trough. The recent shift in tone from the Fed is important, but investors may need more tangible evidence of this before stepping back in. Earnings expectations also still appear too optimistic, although estimates should adjust relatively quickly as we move through what is likely to be a difficult earnings season – providing a more supportive backdrop for stock-picking thereafter, if not an outright market bottom.